Earn $4.49 in VIP credit (449 points)What's This? 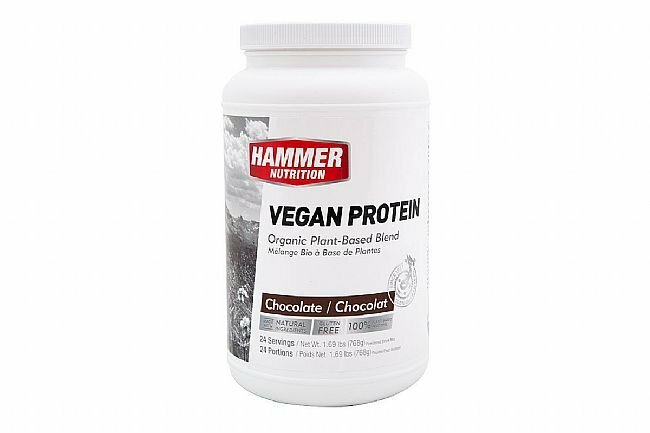 The Hammer Nutrition Vegan Protein Powder allows you to accelerate your recovery, increase your energy levels, and support your immune system with this nutrient-dense, inflammatory-fighting and alkaline vegan protein. Your taste buds will appreciate the delicious flavors and smooth texture, while your body thrives on the organic, non-GMO, soy-free, gluten-free goodness. 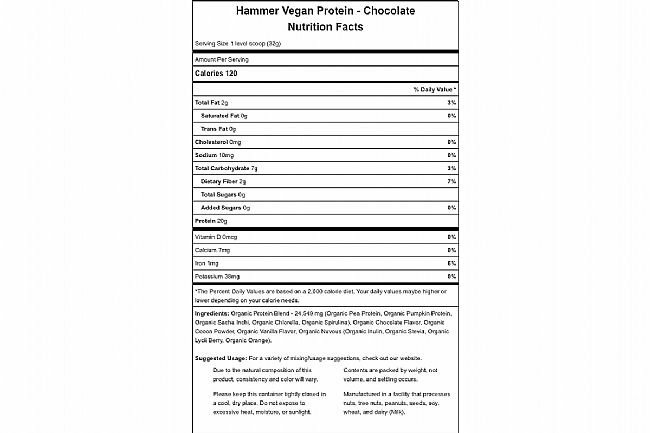 We’ve blended proteins from pea, pumpkin, Sacha Inchi, spirulina, and chlorella to build a complete amino acid profile rarely found in plant-based products. Efficient and complete digestion is ensured by added digestive enzymes. Free of sugar or artificial sweeteners, and rich in vitamins and minerals, it’s everything you want and nothing you don’t. Perfect for a postworkout protein boost, morning smoothie, or afternoon snack. 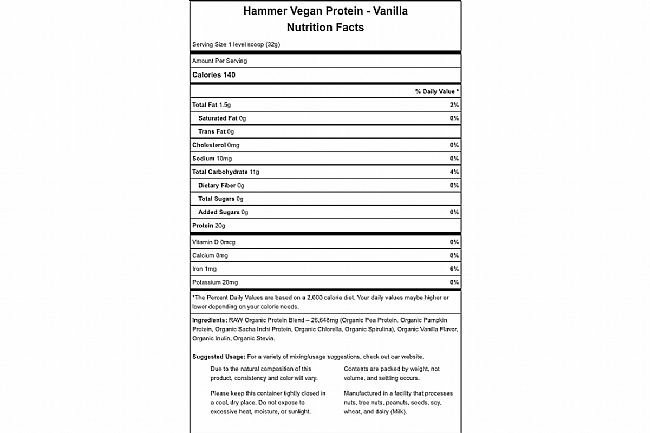 Vegan Protein Powder is available in Chocolate and Vanilla flavors. 24 servings per container. I like Hammer's stuff so I thought I'd give this a try. Not chalky like some of the soy-based powders I've tried, but there's some grit to it - you definitely can tell there's some veggie goodness inside. Tastes decent (vanilla) just mixed with water or iced coffee. Dairy-based protein tends to upset my stomach, which is a bummer since it's so much cheaper than this. 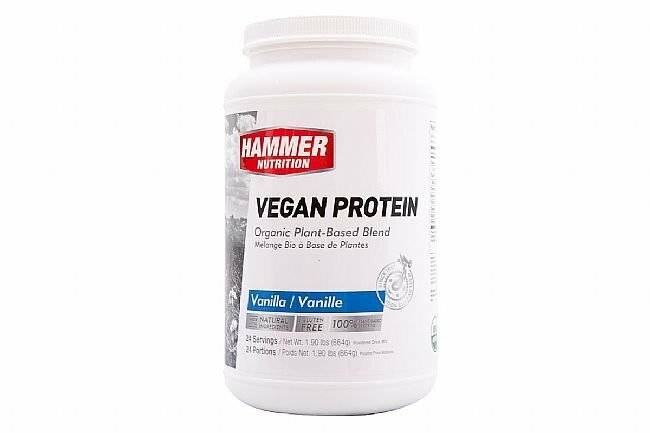 I think I'll switch to whey-based protein during training and use this vegan protein leading up to a race so my stomach is happy on race day. As usual, BTD is my goto for this since VIP points take some of the sting out of the price. Overall a solid product, just expensive (although cheaper than Vega's offerings).